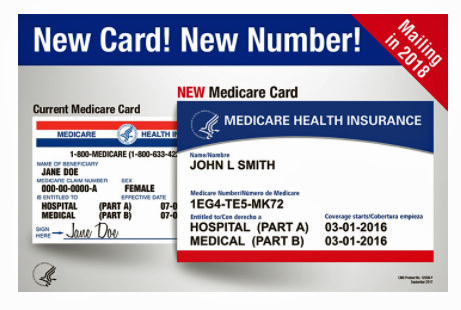 New Medicare Cards/ New Medicare Card Scams | Shapiro Financial Security Group, Inc.
Account Access / Click Here to Send Us Documents! What do Waiting Tables and Financial Planning have in Common? SFSG Named One of the Top 600 RIA Firms in the United States! Should I Take A Vacation? Proxy Voting: Why am I getting these calls? Planning early for the next tax year can save you money - Make Your Appointment at 732-739-8991. Use our Client Portal to send us documents safely and securely anytime of the year! Susan Friedland, Communications and Marketing, Shapiro Financial Security Group, Inc.
Beginning this month, Medicare will begin sending out new Medicare cards to the 44 million Americans who are currently enrolled in the program. The change is an effort by the government to protect seniors and other users from identity theft. Previously, Medicare used Social Security numbers as its’ medical identity number and required recipients to carry the cards with them to assure access to their health care benefits, therefore putting people at risk of having their social security numbers stolen. In 2015, a new law was passed that required that the Social Security numbers be replaced with a less sensitive identifier, as many driver’s licenses now have. The new cards will have an 11-digit identity code that will include both numbers and letters. This is intended to protect users from having their social security numbers stolen and used for various types of fraud. Due to the huge numbers of Americans covered by Medicare, the law provided a long transition period to allow for the change to be made. The roll-out of the new cards will take one year and, during this time, every Medicare recipient will get a new card. The new cards will be sent to Medicare recipients automatically, based on a schedule put out by the Center for Medicare & Medicaid Services. New Medicare recipients will get the cards first. After that, the cards will go out to enrollees in Washington, D.C., Maryland, Pennsylvania, Virginia and West Virginia. They will then be followed by recipients on the west coast and the Territories - California, Hawaii, Alaska, Oregon, Guam and the Northern Mariana Islands. The rest of the country will start getting new cards sometime after June but before April of 2019. Since this is an automatic roll-out process, there is no need to do anything on the recipients’ part. The cards will be mailed and will automatically transfer your coverage to the new identifying number. You don't have to do anything or pay any fee. Medicare will never ask you to give personal information to get your new number and card. When you get your new card, shred your old card and safeguard it like you would any other health insurance or credit card. While removing the Social Security number cuts down on many types of identity theft, you’ll still want to protect your new card because identity thieves could use it to get medical services. In one scam, con artists call Medicare recipients asking for a credit card number to pay a $25 processing fee for the new card. In another, crooks ask the recipient for identifying information, including her Social Security number. The worst of the three cons urges recipients to provide bank account information so that the crook, posing as a federal employee, can "credit" the senior's account for a bogus balance on the old card. To sum up - There are no fees for the cards and you do not have to do anything to get the new card – they are being sent automatically. Hang up on anyone trying to get you to pay anything or to give them your information. As always, please feel free to give Shapiro Financial Security Group, Inc. a call at 732-739-8991 with any questions or concerns. Copyright © 2019 Shapiro Financial Security Group, Inc. All rights reserved.